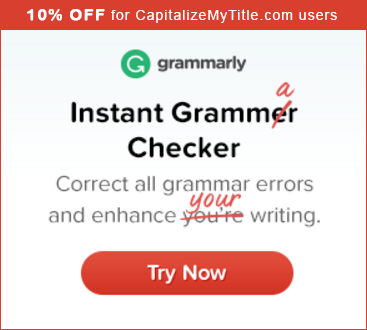 These terms and conditions govern your use of CapitalizeMyTitle.com (“our website”); by using our website, you accept these terms and conditions in full. If you disagree with any part of these terms and conditions, do not use our website. By submitting content or articles on our site, you represent and warrant that you have all the required rights to publish the content or articles and that the content or articles will not infringe the proprietary rights, including but not limited to the copyright, patent, trademark or trade secret rights, of any third party. You further certify that you will hold us harmless against any claims of rights violations caused by any action of yours. You are entirely responsible for the content of, and any harm resulting from, your submitted content or articles. You also agree that by submitting content or articles for public display on our site, you grant us and our members a perpetual, irrevocable, royalty-free, world-wide, and non-exclusive license to publish and use the content or articles. Optional premium paid services are available on our site site. By selecting a premium service you agree to pay us the periodic subscription fees indicated for that service. Payments will be charged on the day you sign up for a premium service and will cover the use of that service for a monthly or annual period as indicated. Unless otherwise stated, subscription fees and/or other fees are not refundable. Service availability often depends on the availability of third-party services over which we have no control. Credit is not provided for periods where service is unavailable or reduced due to the unavailability or interruption of those third-party services. If you initiate a fraudulent charge-back or payment dispute, we reserve the right to permanently ban you from our service. We do not represent or endorse the accuracy or reliability of any of the information, content or advertisements contained on, distributed through, or linked, downloaded or accessed from any of the services contained on this website, nor the quality of any products, information or other materials displayed, purchased, or obtained by you as a result of an advertisement or any other information or offer in or in connection with the services herein. You hereby acknowledge that any reliance upon any Materials shall be at your sole risk. We reserve the right, in our sole discretion and without any obligation, to make improvements to, or correct any error or omissions in any portion of the Service or the Materials. THE SERVICE AND THE MATERIALS ARE PROVIDED BY US ON AN “AS IS” BASIS, AND WE EXPRESSLY DISCLAIM ANY AND ALL WARRANTIES, EXPRESS OR IMPLIED, INCLUDING WITHOUT LIMITATION WARRANTIES OF MERCHANTABILITY AND FITNESS FOR A PARTICULAR PURPOSE, WITH RESPECT TO THE SERVICE OR ANY MATERIALS AND PRODUCTS. IN NO EVENT SHALL WE BE LIABLE FOR ANY DIRECT, INDIRECT, INCIDENTAL, PUNITIVE, OR CONSEQUENTIAL DAMAGES OF ANY KIND WHATSOEVER WITH RESPECT TO THE SERVICE, THE MATERIALS AND THE PRODUCTS. The compensation we receive as an affiliate marketer to provide opinion on products, services, websites and various other topics does NOT affect the topics or posts we make on this site. We abide by word of mouth marketing standards and believe in honesty of relationship, opinion and identity. The views and opinions expressed on this site are purely our own. We always provide our honest opinions, findings, beliefs, or experiences on those topics or products. You must not use our website in any way which violates the terms and conditions of any third-party service. You must not use our website to copy, publish or send material which is illegal or unlawful, or material which could give rise to legal action under English and other applicable law. All material you copy, publish or send via our website must not be defamatory, obscene, indecent, hateful, discriminatory or inflammatory; such material must not infringe any person’s intellectual property rights or rights of confidence, impinge upon any person’s privacy, or constitute incitement to commit a crime; further, material must not be misleading, deceptive, sexually explicit, threatening, abusive, harassing or menacing. In respect of all material that you post for public display on our website, you grant to us a worldwide, irrevocable, non-exclusive, royalty-free license to use, reproduce, adapt, publish, translate and distribute such material in any media, together with the right to sub-license such rights. You agree to indemnify and hold us harmless, our contractors, and our licensors, and their respective directors, officers, employees and agents from and against any and all claims and expenses, including attorneys’ fees, arising out of your use of our site, including but not limited to out of your violation this agreement. This notice will be governed by and construed in accordance with United States Government law, and any disputes relating to this notice shall be subject to the exclusive jurisdiction of the courts of United States Government. You, as a United States Government entity, are required, when entering into agreements with other parties, to follow applicable federal laws and regulations, including those related to ethics; privacy and security; accessibility; limitations on indemnification; fiscal law constraints; advertising and endorsements; freedom of information; and governing law and dispute resolution forum. CapitalizeMyTitle.com (“Company” or “We”) and You (together, the “Parties”) agree that modifications to the CapitalizeMyTitle.com standard Terms of Service, available at https://capitalizemytitle.com/terms (the “TOS”) are appropriate to accommodate Your legal status, Your public (in contrast to private) mission, and other special circumstances. Accordingly, the TOS are hereby modified by this Amendment as they pertain to Agency’s use of the Company web site and services. A. Government entity: “You” within the TOS shall mean the Agency itself and shall not apply to, or bind (i) the individual(s) who utilize the Company site or services on Agency’s behalf, or (ii) any individual users who happen to be employed by, or otherwise associated with, the Agency. B. Public purpose: Any requirement(s) set forth within the TOS that use of the Company site and services be for private, personal and/or non-commercial purposes is hereby waived. C. Agency content serving the public: Company hereby approves Agency’s distribution or other publication via the Website of materials which may contain or constitute promotions, advertisements or solicitations for goods or services, so long as the material relates to the Agency’s mission. D. Advertisements: Company hereby agrees not to serve or display any third party commercial advertisements or solicitations on any pages within the Company site displaying content created by or under the control of the Agency. This exclusion shall not extend to house ads, which Company may serve on such pages in a non-intrusive manner. E. Indemnification: All indemnification and damages provisions of the TOS are hereby waived. Liability of Agency for any breach of the TOS or this Agreement, or any claim arising from the TOS or this Agreement, shall be determined under the Federal Tort Claims Act, or other governing authority. Liability of Company for any breach of the TOS or this Agreement, or any claim arising from the TOS or this Agreement, shall be determined by applicable federal law. F. Governing law: The dispute resolution provision in the TOS is hereby deleted. The TOS and this Amendment shall be governed, interpreted and enforced in accordance with the federal laws of the United State of America. To the extent permitted by federal law, the laws of the United States of America will apply in the absence of federal law. G. Changes to standard TOS: Language in the standard TOS reserving to Company the right to change the TOS without notice at any time is hereby amended to grant You at least three days advance notice of any material change to the TOS. Company shall send this notice to the email address You designate at the time You sign up for service, and You shall notify Company of any change in the notification email address during the life of the Amendment. H. Access and use: Company acknowledges that the Agency’s use of Company’s site and services may energize significant citizen engagement. Language in the TOS allowing Company to terminate service, or close the Agency’s account, at any time, for any reason, is modified to reflect the Parties’ agreement that Company may unilaterally terminate service and/or terminate Agency’s account only for breach of Agency’s obligations under the TOS or its material failure to comply with the instructions and guidelines posted on the Site, or if Company ceases to operate its site or services generally. Company will provide Agency with a reasonable opportunity to cure any breach or failure on Agency’s part. I. Provision on crawlers: The provision in the TOS prohibiting “crawl” or “spider” processes is amended to allow the Agency to apply such tools solely to its pages and solely to fulfill Agency’s obligations under the Federal Records Act or other applicable federal law or regulation. J. Ownership of names: Any provision(s) in the TOS related to Company’s ownership of and right to change Your selected user name(s), user ID(s), domain name(s), channel name(s), and group name(s), are modified to reasonably accommodate Agency’s proprietary, practical, and/or operational interest in its own publicly-recognized name and the names of Agency programs. K. Modifications of user content: Company agrees that the right reserved in the TOS to “modify” or “adapt” Your content is limited to technical actions necessary to index, format and display that content. The right to modify or adapt does not include the right to substantively edit or otherwise alter the meaning of the content. Notwithstanding the foregoing, nothing in this Amendment shall result in an expansion of Your rights as a United States Government entity under the Copyright Act of 1976 (17 U.S.C. §§101 et sec. ), specifically including Section 105 of the Act. L. Limitation of liability: The Parties agree that nothing in the Limitation of Liability clause or elsewhere in the TOS in any way grants Company a waiver from, release of, or limitation of liability pertaining to, any past, current or future violation of federal law. M. Uploading, deleting: The Parties understand and agree that You are not obligated to place any User Content on the Company site, and You reserve the right to remove any and all User Content at Your sole discretion. N. No endorsement: Company agrees that Your seals, trademarks, logos, service marks, trade names, and the fact that You have a presence on the Company site and use its services, shall not be used by Company in such a manner as to state or imply that Company’s products or services are endorsed, sponsored or recommended by You or by any other element of the Federal Government, or are considered by these entities to be superior to any other products or services. Except for pages whose design and content is under the control of the Agency, or for links to or promotion of such pages, Company agrees not to display any Agency or government seals or logos on the Company’s homepage or elsewhere on the Company Site, unless permission to do has been granted by the Agency or by other relevant federal government authority. Company may list the Agency’s name in a publicly available customer list so long as the name is not displayed in a more prominent fashion than that of any other third party name. O. No business relationship created: The Parties are independent entities and nothing in this Amendment or TOS creates an agency, partnership, joint venture, or employer/employee relationship. P. No cost agreement: Nothing in this Amendment or TOS obligates You to expend appropriations or incur financial obligations. The Parties acknowledge and agree that none of the obligations arising from this Amendment or TOS are contingent upon the payment of fees by one party to the other. R. Separate future action for fee based services: Company provides services at a basic level free of charge to the public, but this may change in the future. You acknowledge that while Company will provide You with some services and features for free, Company reserves the right to begin charging for those services and features at some point in the future. Company will provide you with at least 30 days advance notice of a change involving the charging of fees for the basic level of service. You also understand that Company may currently offer other premium and enterprise services for a fee. The Parties understand that fee-based services are categorically different than free products, and are subject to federal procurement rules and processes. Before an Agency decides to enter into a premium or enterprise subscription, or any other fee-based service that this Company or alternative providers may offer now or in the future, You agree to determine your Agency has a need for those additional services for a fee, to consider the subscription’s value in comparison with comparable services available elsewhere, to determine that Agency funds are available for payment, to properly use the Government Purchase Card if that Card is used as the payment method, to review any then applicable TOS for conformance to federal procurement law, and in all other respects to follow applicable federal acquisition laws, regulations, and agency guidelines when initiating that separate action. S. Assignment: Neither party may assign its obligations under this Amendment or TOS to any third party without prior written consent of the other. T. Precedence; Further Amendment; Termination: This Amendment constitutes an amendment to the TOS; language in the TOS indicating it alone is the entire agreement between the Parties is waived. If there is any conflict between this Amendment and the TOS, or between this Amendment and other rules or policies on the Company site or services, this Amendment shall prevail. This Amendment may be further amended only upon written agreement executed by both Parties. Agency may close Agency’s account and terminate this agreement at any time. Company may close Agency’s account and terminate this agreement on 30 days written notice. U. Posting and availability of this Amendment: The provision of the TOS requiring modifications to the TOS to be posted on Company’s website is inapplicable since this Amendment is of limited, not general, application, and is otherwise waived for this special circumstance. The Parties agree this Amendment contains no confidential or proprietary information, and You may release it to the public upon request and to other agencies interested in using Company Site and services. Additional Items for Discussion and Possible Inclusion in this Agreement: Company understands current federal law, regulation and policy may affect Agency’s use of the Company’s products and services in ways not addressed in the list of clauses above. Much depends on the nature of the products and services offered by the Company (which may change from time to time), and how Agency intends to use those services (which also may change). The following are among the topics Agency may need to discuss with Company. Discussion of these items may lead to the insertion of additional clauses in this Agreement.